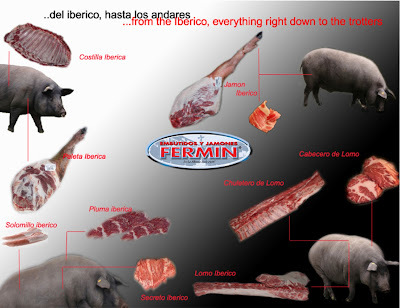 There still seems to be much confusion out there about the exact location of the pork secreto cut. Count me still as one of the confused. I'm still not sure exactly where the cut comes from, I guess I just don't have a good enough working knowledge of porcine anatomy. But in response to some recent interest in the comments of my earlier post about secreto, I decide to do some more sleuthing. I've heard multiple descriptions of the location: hidden beneath belly fat, skirt steak, under the shoulder blade next to the ribs, between the shoulder, ribs and fatback, and more. I don't know if they are describing the same thing, if some are wrong, or alternatively if there are two different cuts both referred to as the same name, eg sweetbreads can be either thymus or pancreas. My guess is that it's just difficult to describe and most are talking about the same thing. I did find this chart (in flash) which provides another clue, and I believe that since pork belly does wrap up the side of the hog to cover the ribs, that describing it as under the belly and behind the rib might both be correct. In any case, by pure coincidence of timing, Florence Fabricant just put out a story about where to get your hands on some of this exquisite fresh ibérico, either shipped to your home or dining out in NY, although she calls it skirt steak and not secreto. You can buy it at la tienda, Wagshal's, or NickyUSA. I've got some in my freezer waiting for weekend BBQ weather to grace us. If you want to dine out chef Chris DeLuna at la fonda del sol is currently offering three different cuts (pdf) of fresh ibérico, including the secreto. I'll probably try to get over there to check them out. Seamus Mullen was also running it frequently as a blackboard special at his restaurant Tertulia, but it was a while back when I was last there. I know this is a little old but my mother lived in Spain in the past couple years and my uncle opened a restaurant using this cut of pork. She said it dissolves in your mouth but has the consistency sort of like a fatback meets a pork shoulder. She believes it is the lining meet because there isn't a lot of it. She said it was expensive for being something people used to ignore. She said the popularity is almost of how tri-tip is huge now. Anyway I still haven't figured out exactly where it was and that could explain the secret name. Anyway... awesome article. If you're ever in Spain in Chiclana check out my uncles restaurant Rocka n Burger bar. Still a great awesome american Italian restaurant with good home based food.